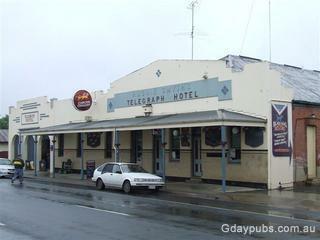 Telegraph Hotel Incorporating the Black Dog bistro. In the Facia you can see the wording "Hughie Smith's". Hughie must have owned at some stage. Located 500 metres of the Hume Highway and known notably for the filming of Walt Disney's Ride a Wild Pony in 1974. An historic and appealing town of some 1400 people and wonderful old brick and timber buildings.